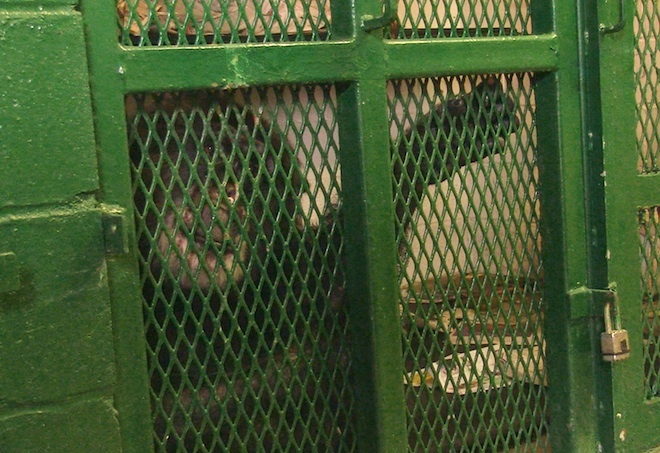 Noting that the Nonhuman Rights Project ”requests that this Court enlarge the common-law definition of ‘person’ in order to afford legal rights to an animal,” the Court’s decision was that “We decline to do so, and conclude that a chimpanzee is not a “person” entitled to the rights and protections afforded by the writ of habeas corpus. NHRP goes on to explain in detail why it disagrees with the decision, and says it will appeal the decision to the New York Court of Appeals. While it would have been great if the Appellate Court had granted Tommy a writ of habeus corpus, establishing basic personhood rights to an animal for the first time (and, importantly, opening the door to his tiny cage in a trailer park so he could be moved to a sanctuary), the refusal to grant Tommy basic rights was not necessarily a surprise. This has probably always been a question that will be decided at the highest appeals court level (though it would have been nice to go to that level with a positive ruling to defend), and now the argument has just moved one level up the chain. But the next level, the New York Court of Appeals, is the final level. If NHRP does not win the argument before that court, then that will put an end to its efforts to win personhood rights for a chimp via Tommy. The chance that its arguments for any single animal might fail is the reason NHRP originally launched legal bids on behalf of four chimps, to try to improve the odds of a successful outcome. So if Tommy’s case doesn’t come to a successful conclusion, the hope is that Kiko, Hercules or Leo will deliver. Stay tuned. This is the long game.